Chrome has a new bookmark manager, and it’s very nice. Having used delic.ious for years, until my tags got too unwieldy, and I finally gave up on the Yahoo password recovery feature, I have needed some system to keep my bookmarks in sync. Hey Presto Google Chrome. I use it everywhere, and I really like using my favorites bar, butting home and work folders on it for ease of use. However, as my bookmarks grew it was becoming difficult to arrange them. 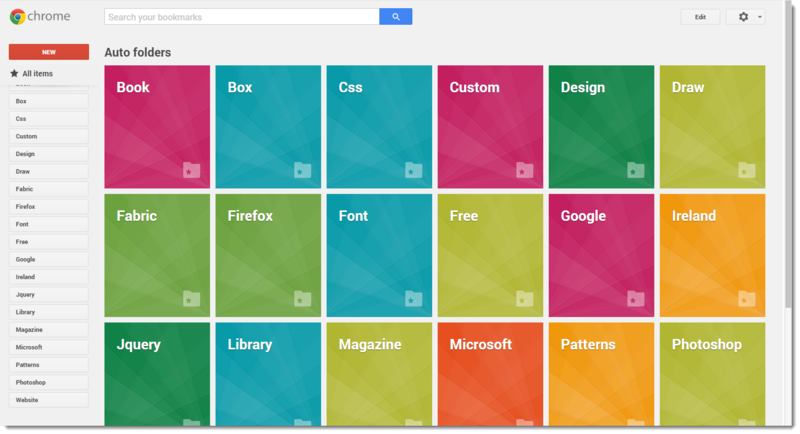 The new bookmark manager is available from the chrome web store. It puts a little gray star into your address bar and lets you bookmark anything from there. When you visit a previously bookmarked page, the star is yellow. I was not too clear on how to view all your bookmarks in the new manager, but when you click on the yellow star, there is a link to view all bookmarked items. When I opened this I just dragged it as a shortcut to the favorites bar. Bookmark manager organizes your folders for you , creating expandable headings, all items, bookmarks bar, folders and auto folders. I really like the auto folders feature. The simplicity of it is nice. It probably makes you look and browse through items a bit more too. You can edit your bookmarks very easily, move them from one folder to another, and even add noted. If you create a new folder, you can even share it with someone. It does not seem to allow you to share or make public already created (imported ) folders though which is a shame.